Robert A. Taft has been neglected by some historians and political theorists and vilified by others. Vigorously and impartially written, this book analyzes the ideas and influence of a great U.S. senator of the twentieth century. 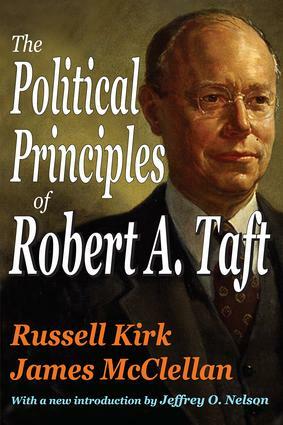 Here readers will find a close and lively examination of Taft's convictions on freedom, justice, labor policy, social reform, foreign affairs, and the responsibilities of political parties.Respected for his intelligence and integrity, Robert Taft was considered the most remarkable public man of a turbulent political era. He was strong and candid, yet was repeatedly denied executive power. Despite this, he will undoubtedly be long remembered.Drawing on many contemporary sources, including the Taft Papers in the Library of Congress, Kirk and Mc- Clellan set Taft in historical perspective. Taft's enduring significance to a normative theory of politics is made clear in this careful study, which includes extensive quotations from his outstanding speeches and writings. Available in paperback for the first time, this edition includes a new introduction by Jeffrey Nelson, who has been closely associated with Russell Kirk.